the world is mine: .the basketball game. 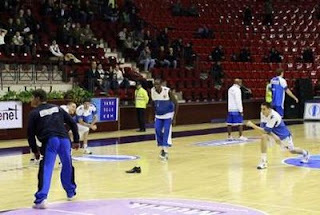 Players of Israel's Bnei Hasharon warm up as a shoe thrown by a protester lies on the court before their ULEB Eurocup Group D basketball game with Turkey's Turk Telekom in Ankara January 6, 2009. The basketball game was suspended on Tuesday after Turkish fans erupted in protests against the Israeli offensive in the Gaza Strip, Turkish media reported. 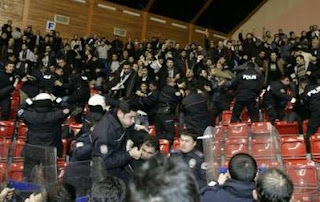 A referee suspended the game and ordered the players back to the dressing room after hundreds of Turkish fans began chanting "Israel, killers!" in an Ankara sports centre. 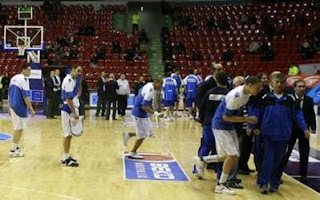 Players of Israel's Bnei Hasharon leave the arena at the beginning of their ULEB Eurocup Group D basketball game with Turkey's Turk Telekom in Ankara January 6, 2009. 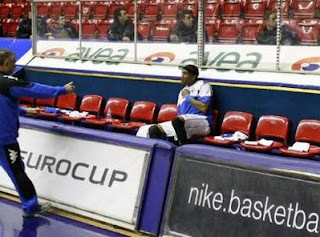 Ugonna Onyekwe of Israel's Bnei Hasharon sits on the bench to protect himself from objects thrown by protesters at the beginning of their ULEB Eurocup Group D basketball game with Turkey's Turk Telekom in Ankara January 6, 2009. 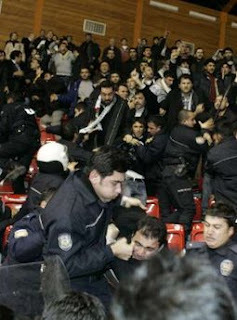 Riot police and a group of protesters scuffle during the ULEB Eurocup Group D basketball game between Turkey's Turk Telekom and Israel's Bnei Hasharonthe in Ankara January 6, 2009. 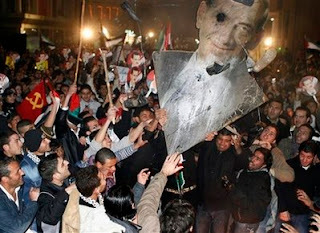 Syrian angry protesters, wave a poster of Israeli Prime Minister Ehud Olmert, during a demonstration against the Israeli attack on Gaza Strip, in Damascus, Syria, Tuesday Jan. 6, 2009. French President Nicolas Sarkozy urged Syria on Tuesday to exert pressure on its ally Hamas in order to help end the fighting in the Gaza Strip between the militant Palestinian group and Israeli forces.